So, as you know, I asked the two Democrats and the one Republican running for mayor of Stamford if they would take a one-mile bike ride with me through downtown. Even though the purpose of the ride is the ride, I mainly just wanted to make sure that the next mayor of the city I call home would have the perspective of a cyclist and hopefully see how just a little investment in bike infrastructure would make the entire city function better for all travelers. Plus, a great way to promote casual and commuter cycling is for as many people as possible to see good looking people riding bikes, and when I think of good looking people, I immediately think about Stamford's slate of mayoral candidates. So if you are good looking or know someone who is, please take a picture of yourself (or him/her) on a bike and post it somewhere. Use the hashtag '#takeabikeride'. I did a ride with Republican Michael Fedele and I thanked him very much. Later, the day before my vacation in California, I rode with Democrat William Tong and I thanked him very much. Today, completely over the jet lag, fully caught up on 'Breaking Bad' and with less than a week to go before the primary, I rode with Democrat David Martin. And I thanked him very much. In other words: I asked three candidates to take a one-mile bike ride with me and all three said yes. I did not have anywhere near this kind of success rate when I was asking girls out back in high school. 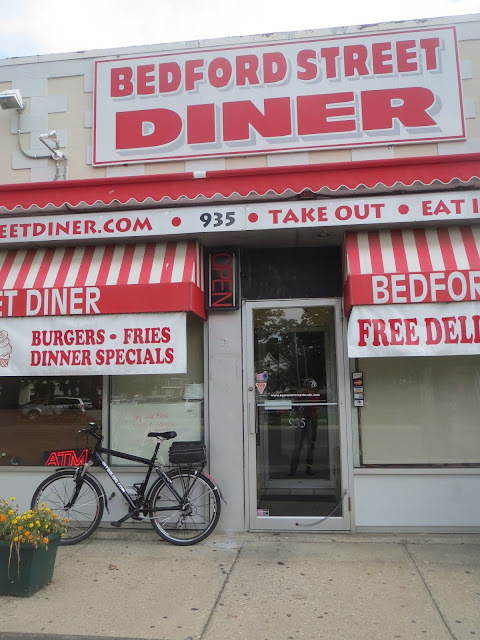 We had arranged to do the ride at 9:00 in the morning today (Thursday) and meeting, as usual, at the Bedford Street Diner. Now Fedele's ride, if you recall, was earlier on a morning while Tong's ride was done in the afternoon rush hour. Once again I had the chance to wonder what kind of city would greet the two of us on the ride from the diner to the government center. Would he prefer a large number of motorists who have already drank their coffee, or, (as I usually find early in the mornings) a smaller number of motorists who are cranky and inattentive because the coffee hasn't kicked in yet? But this morning I had my answer to an easy question: I was at the Bedford Street Diner well within the 'donut window' and decided to indulge. I'll stay in the big chainring and take the extra long way back after the ride is over, I thought. David was at the diner when I arrived, and standing near one of the booths we introduced ourselves and talked for a few minutes. I found out quickly that like William Tong and Michael Fedele, he was mostly a recreational rider. David told me that when he was growing up in south Kansas City, he recalled that would often ride through a cornfield not far from his home, and after using bikes a lot in and after college and immediately following graduate school, he's mostly cycled on vacations - and, like the others, not so much in Stamford. While David pulled his bike out of his car and prepared it, I chatted with Lindsay, a photographer from the Stamford Advocate and Christina from itsrelevant.com. At one point I mentioned how nice it would be if I could take this concept to the presidential race in 2016 (someday you may in fact visit DIYBIKING.COM and see a picture of New Jersey governor Chris Christie smiling and wearing a bike helmet). Speaking of which: as you know, this project has the time-honored tradition (if you can call four weeks 'time' and two earlier rides 'tradition') of showing the mayoral candidate wearing a bike helmet, so here I present Democrat David Martin. Lindsay left in her car so she could get ahead of us to take photos of the ride, so moments after her car was out of sight David and I set off. The right turn onto Bedford Street and the left turn onto Oak were both uneventful, but we did have to wait for traffic on that rather sinister left onto Summer Street, so I took a moment to tell him of my mixed feelings about the 'bump-outs' which, according to the paint marks on the concrete, were probably going to be added to that intersection at a later date (for those of you who don't know, bump-outs are when sections of sidewalk are 'bumped out' into the road to make the road narrower. Done right, it forces cars to turn less aggressively. Done wrong, and you've got a sidewalk that looks as though it is digesting a large animal and less room on the newly narrowed road for a bike lane). We headed down Summer Street, and the din from the cars and the fact we were almost always single file made conversation difficult. Like the other two candidates, I watched David as closely as I could through my helmet rearview mirror. I asked myself the usual questions: is this person getting it? Seeing how just a little bit of investment in bike lanes, downtown racks and other things could make this experience better? Notice how we're going faster than a lot of cars out there? One question I did ask aloud while passing a Greek restaurant I love was "That's a great place - have you been to Eos?" but I didn't hear his answer over the traffic noise. We then approached the red light on the corner of Summer and Broad - I pointed out it would have been easier if the car lanes were narrower and if there was a bike lane in the mix - and turned right to ride with traffic until we stopped at the red, where I promptly took a photo that will wind up with a Pulitzer someday…or I accidentally pushed the shutter button while taking the camera out. Now seasoned with this turn (which I rarely made before I started 'Cycling with Candidates) I told David we had to move fast as soon as the light went green, and we did. A red light on a stretch of Washington Boulevard gave us another chance to talk briefly, and he mentioned the importance of us not getting 'doored' by any of the cars along the street (important for any cyclist), explaining one of his daughters who lives in New York City experienced that while riding a Citibike from the city's new bike share program, but unlike most Citibike riders, she was wearing a helmet (also important for any cyclist). Nearly on cue, a creaky door of a brown car opened up into traffic as a man got out, but we both avoided the danger easily while pointing and saying things like "there's one!" and "perfect example!" which probably baffled the driver. A few moments later, we had arrived at the government center. I immediately breathed a sigh of relief: three candidates, one mile through rush hour each, not one fatality. Cycling progress in the city would not be set back on my watch. I thanked David and also his campaign volunteer, who had followed in his car. I thought she was going to pick him up, but he said he was going to ride around the corner to his campaign office to plan for the next event. After all, there is a primary coming up in five days, after which either himself or Tong will give a concession speech. Win or lose, there's a lot to be done by both camps by then - and even more to be done afterward. David turned right on his bike and headed off. Soon after, I got back on my own bike to return to my workplace, once again riding on Bedford Street and imagining how it might look different and possibly more bike friendly someday. I appreciate the time of all three candidates for engaging in this - as I've said before I'm not judging any of them on their attire, choice of equipment, or how they feel about certain projects. In fact, I am hoping that as we get closer to the general election, we see some published policy statements and positions about city streets and their thoughts on cycling. Yes, all three of these candidates, to some degree, talked of what they might do as mayor but I want you to hear it from them, not me. No matter what there will be more 'Cycling With Candidates' updates to come. Thanks for reading and thanks for riding - especially if you live and work in Stamford. Love it. 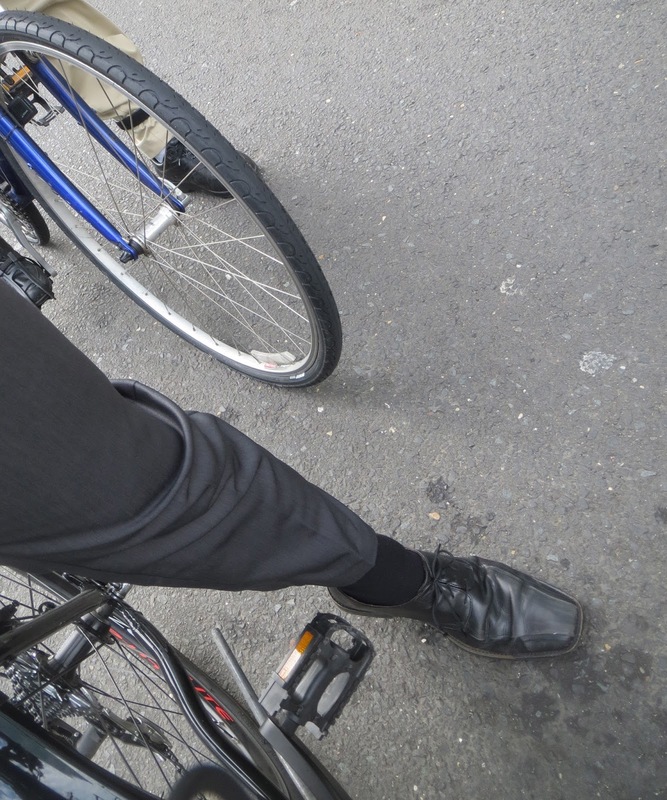 I'm an avid commuter cyclist in Stamford and know the routes well. I'm also a videographer for David Martin and would loooooove to see more bike lanes.